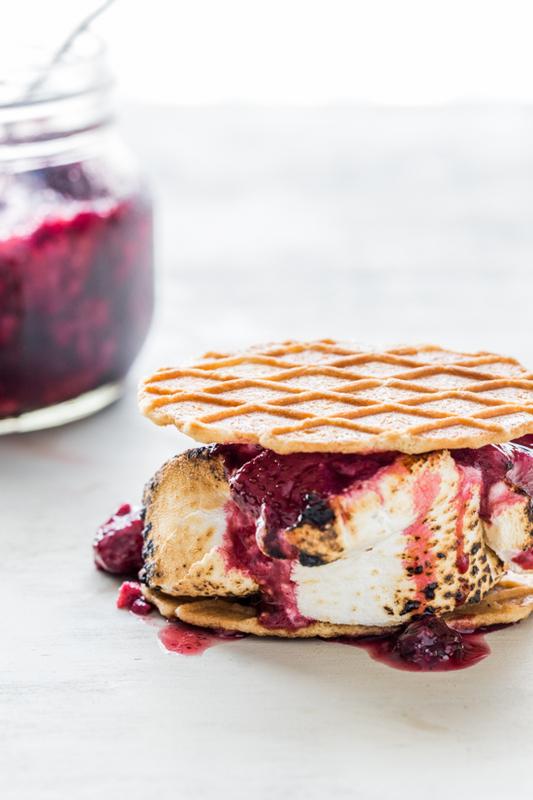 Roasted Berry S’mores are a fruity twist on a campfire classic! 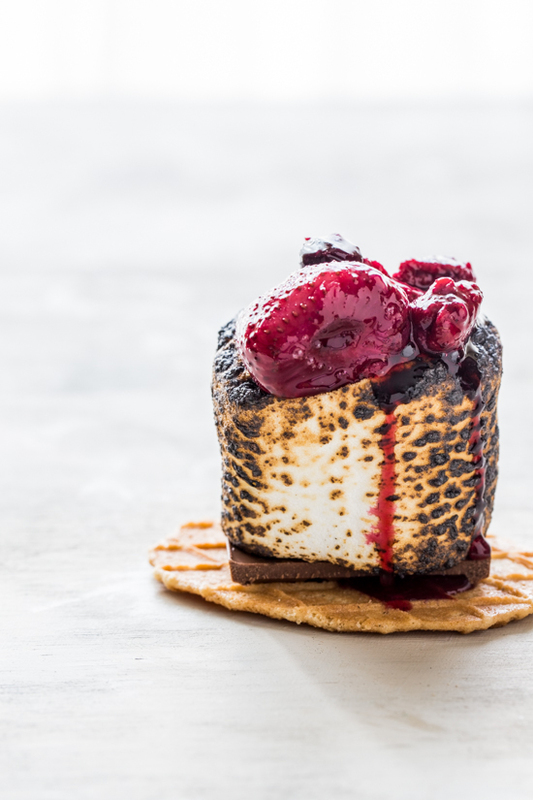 These sweet, roasted treats are made even more decadent with Campfire® Marshmallows Giant Roasters. 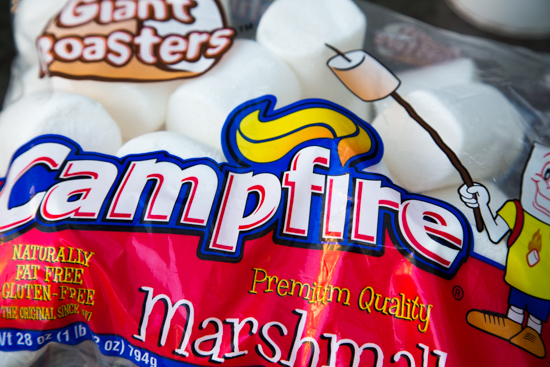 Disclosure: This post is brought to you by Campfire® Marshmallows. All thoughts and opinions are, as always, 100% my own. As soon as the weather warms up, camping becomes a serious topic of conversation in our house. We spend time looking at our summer calendar and planning out how many weekends we can devote to camping. Whether it’s in our very own back yard or at a camp ground, the experience of being together, sleeping in a tent and cooking around the campfire is something that we all look forward to. It’s pure family time, and frankly, a ton of fun. When we camp, flashlights and glow sticks are a must at night. I’m not sure what the kiddos would do if they didn’t get to have their nighttime rave around the tent. Dinner over the campfire usually consists of hot dogs, baked beans and corn before moving on to the campfire popcorn. If you’ve never made campfire popcorn, you’re missing out. It’s smokey, salty and just plain delicious. But not more delicious than s’mores. Last fall, I shared the Buddy’s camping themed 6th birthday party where we served up a huge spread of s’mores makings. A variety of chocolate bars and marshmallows to build your very own, personalized s’mores. That was quite possibly the most fun party that we’ve ever thrown. Simple food and s’mores. This past weekend, we uncovered our fire pit after our long brutal winter and made our very s’mores of the season. To make the occasion even more special, I whipped up a batch of sweet, roasted berries to drizzle over the toasted marshmallows. 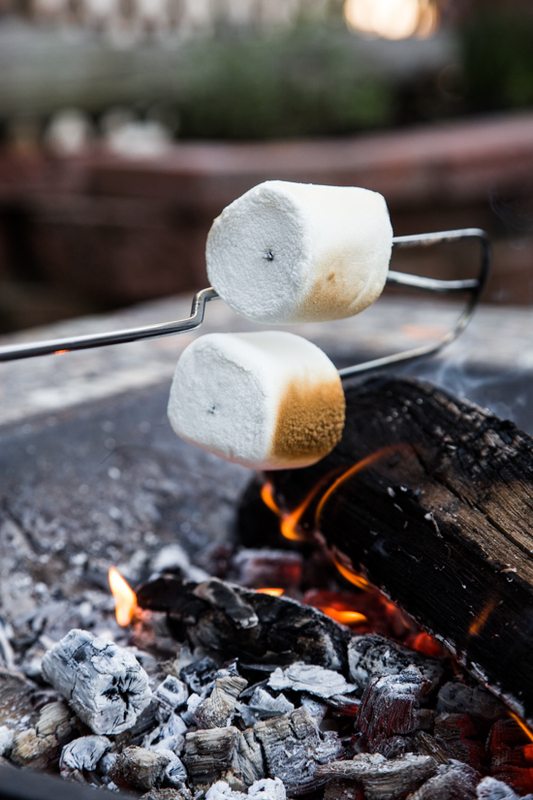 And not just any marshmallows – Campfire® Marshmallows Giant Roasters. Have you seen these Giant Roasters? They’re enormous – both in size and in flavor! Breaking these out during our camping trips and backyard adventures always brings the huge smiles (not to mention sticky cheeks) to the kiddos’ faces. 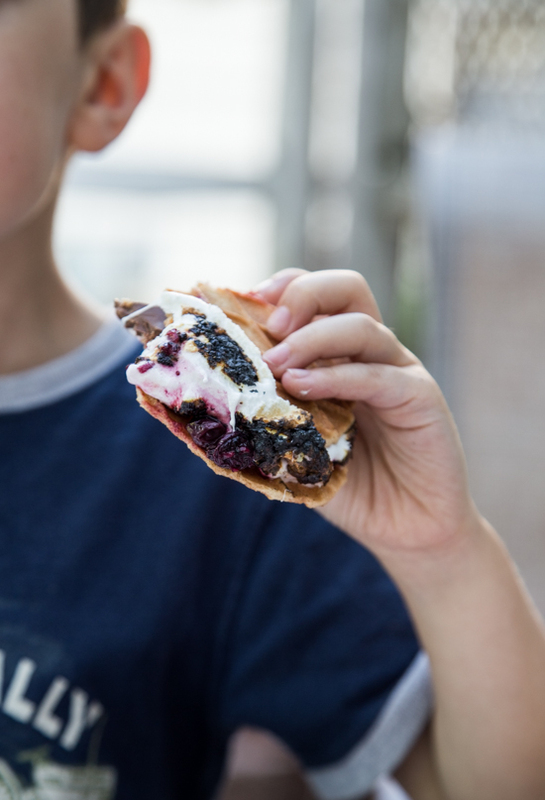 These Roasted Berry S’mores were a hit with the whole family. 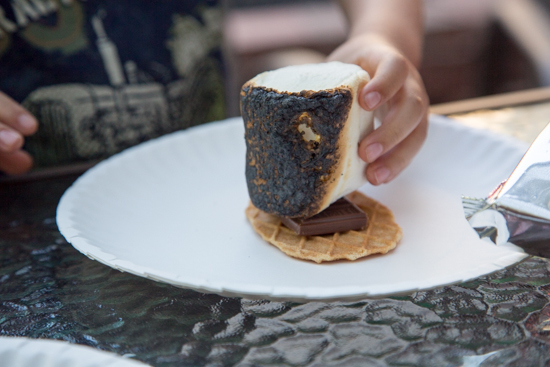 Sweet, crunchy waffle cookies, a chunk of milk chocolate and a perfectly toasted Giant Roaster marshmallow. All of that drizzled with the slightly spiced berries made for some seriously epic s’mores. The addition of the juicy, roasted berry sauce with vanilla and cardamom is unexpected, but oh so amazing. It makes me want to roast all the fruits just for the purpose of spooning them over warm and melty Giant Roasters. I’m just so excited to have s’mores season officially underway! In fact, Jamie from My Baking Addiction and I have teamed up with a few other amazing bloggers as well as Campfire® Marshmallows to share some of our favorite twists on the campfire classic s’mores. 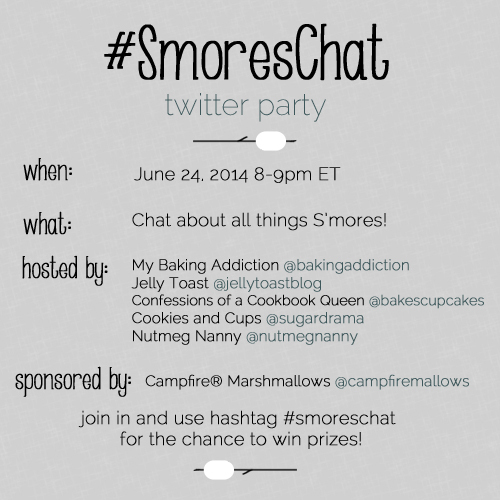 At the end of the month we’ll be getting together on Twitter to chat all about our favorite s’mores. Join us to share your faves and for the chance to win some great prizes. In the mean time, I’ve got more s’mores to make. And eat. Preheat oven to 450 degrees. In a large bowl, toss together berries, sugar, vanilla and cardamom. Spread onto a rimmed baking sheet and bake for 20-25 minutes or until the fruit is soft and tender. Allow to cool. 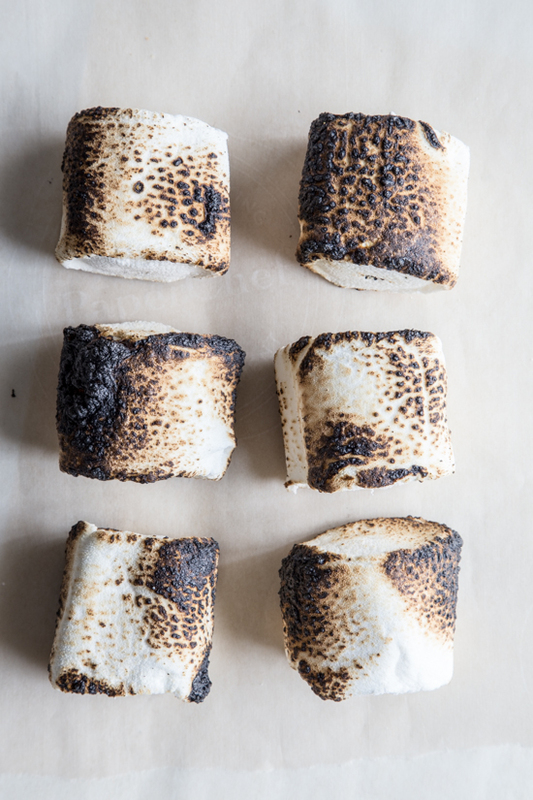 Roast Campfire® Marshmallows Giant Roasters until golden brown and gooey. Place a piece of milk chocolate onto one waffle cookie. Top with roasted marshmallow and drizzle with reserved berry sauce. Top with second waffle cookie. Enjoy! Maan these smores look super delicious. Loving the sound of those cardamom roasted berries! I’m a cardamom fanatic lately! Thanks so much for stopping by, Rochelle!! When my friends and I went camping the other weekend, we did the ol’ cruise the campground and check out what everyone else is cooking bit. One site had those ginormous marshmallows and we were soooo jealous that all we had were the normal size. These s’mores look amazing! Roasted berries?!!! Genius! I love that you all are doing a s’mores chat! How fun and clever. First of all, those mallows are Ridiculous!! Humongous! Second, I love the mixed berry compote over the marshmallows. I bet that sweet-tart fruitiness plays nicely with all the sweet-sticky mallow and milk chocolate. Third, it must be fate. Someone literally just asked me today if I could make a S’mores ice cream for an upcoming Ice Cream Tuesday. I said yes but that I would probably not go with a straight-up traditional version because: boring. So, I am going to turn your S’mores creation into ice cream, if that’s okay with you. Of course I’ll link here as the inspiration. What do you think? Those marshmallows are the size of my head! Love this updated spin on classic summer treat! Oh god yes. I cannot get over the size of those marshmallows. I think I could polish off 5 or 6 of those s’mores. Amazing. I love that you’re making camping a part of your family tradition. We camped a lot growing up and I have such fond memories of gathering around the campfire. I love that these marshmallows are giant! I always want more marshmallow to chocolate ratio so these would be perfect! These are so gorgeous, I love the roasted berries! I’m so excited it’s finally summer, if only because it’s the best excuse to immediately get to making these smores. Winter will make it’s unwelcome return before long. Berries AND chocolate AND marshmallows? Killer! Aw, thanks Mallory!! My husband went crazy over these and it’s such a simple way to jazz up a typical s’mores! Your blog is so beautiful!! I will be coming back.. These look absolutely amazing, Em! My menagerie fawns over those gigantic marshmallows each time we walk though the baking aisle. Delish! 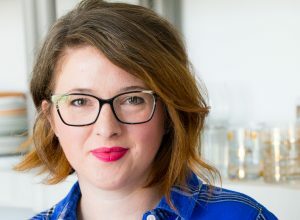 Just discovered your beautiful blog and HOLY GUACAMOLE! You are crazy talented! Congrats on all of your successes. Can’t wait to explore more! Thank you so much, Kelly! I’m glad you stopped by! I found your post from Pinterest! I’m also gonna pin this post on my Pinterest board my followers will love it. I am obsessed with desserts! Definitely roasted berry smores will be yummy! Thx for sharing! Gorgeous pictures. I made these roasted berry smores for the super bowl party and it was a crowd favorite. The colors are so vibrant and your photography is fantastic! 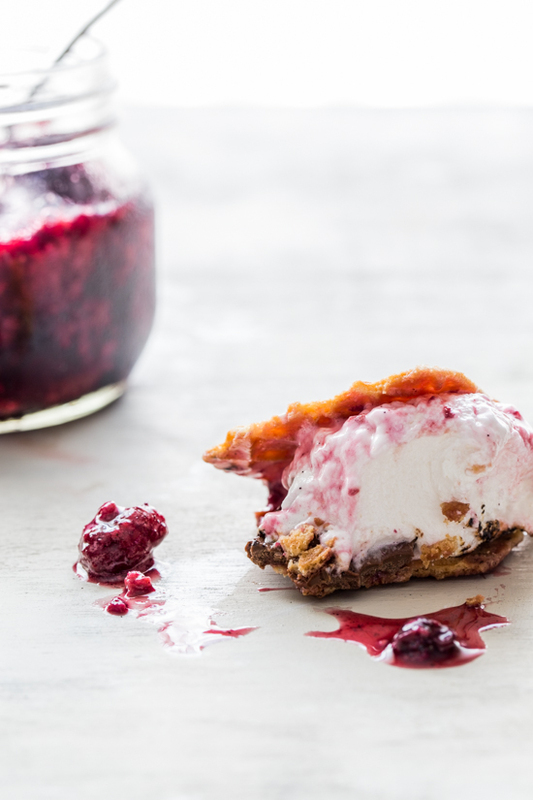 Thx for sharing roasted berry s’mores recipe, I definitely add it to my cookbook!